Solar Decathlon house donated to Cal State San Marcos | West Coast Solar, Inc.
A house that was entered into the U.S. Department of Energy’s Solar Decathlon competition in October will be donated to the campus of California State University at San Marcos, near Camp Pendleton. The structure, which was designed by students of Stevens Institute of Technology in New Jersey, will be used as a veterans’ affairs office, aimed at providing services such as GI benefits distribution and class registration for student and faculty members who are veterans. The house, called Ecohabit, utilizes solar energy for all of its electrical needs and uses a smart water heating system to provide hot water to occupants when needed. 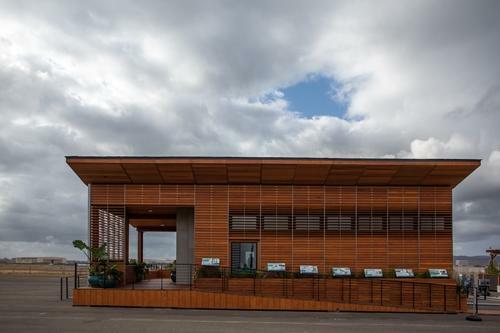 The Solar Decathlon was a competition that pitted teams of university students from all over the world against each other to design homes that were affordable, aesthetically pleasing and solar-powered. The Stevens Institute team eventually placed fourth in the competition with Ecohabit, which was designed for a Southern California climate. The success of Ecohabit lies in its ability to demonstrate the practicality and utility of solar power as a means of procuring electricity, as well as the feasibility of incorporating this technology into new structures. One notable feature of the home is that, although it relies entirely on solar power, it has a relatively small array of photovoltaic (PV) panels providing that electricity. Readers should note that you needn’t be a member of an academic research team at a university in order to take advantage of solar. For more information on how we can convert your home to a residential PV system, contact West Coast Solar today.